Spend More or Convert More – Which is Better? As everyone’s resources are limited, we’re left to decide whether spending more on driving traffic will get us closer to our goals, or whether we should focus more on capturing the traffic that’s already arriving. Ultimately, it depends on your website and if it’s converting at the rate you want or need it to. Spending money on traffic generation won’t work if your website isn’t optimized to capture traffic. The goal of capturing traffic is to turn it into leads. Imagine spending money on a PPC campaign, only to see all of those visitors come and go, never to be seen again. No way to contact them. No way to know if they were potential customers. No way to convince them that your products and services are better than your competitor’s. Now, if your website is optimized to capture traffic, you have a chance to build a connection with those people (your potential customers). You can send them relevant content that helps them solve their problems. You can ask for feedback to help you make your products better. You can present your service as the natural “done-for-you” solution to their problems. All of this because you took the time to optimize your site before spending money on traffic generation. You know you should focus on capturing traffic first, but how do you do it? Luckily, you can retain visitors in a lot of ways. We’re going to go through three of these tactics. Note that each tactic below involves an opt-in form that collects contact information. This information is collected in exchange for something of value. These valuable giveaways are your tactics to capture traffic. Ebooks are some of the most popular free content downloads. Almost every website that captures traffic offers free ebooks and PDF downloads. Because ebooks are great ways to condense lots of information into a format that people enjoy consuming. 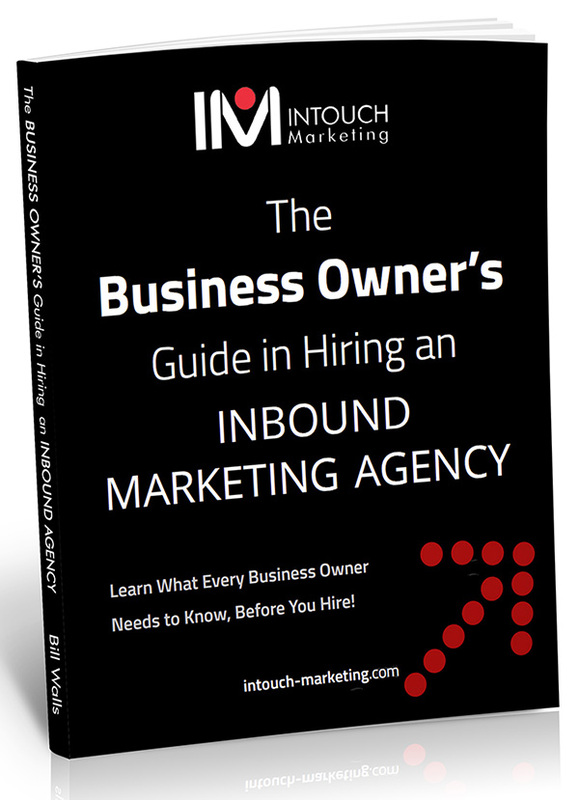 Offering an ebook designed to help solve a solution, is a great way to convert a visitor into a potential lead. Once downloaded, people can take it with them anywhere on their computers and mobile devices. No internet required. They’re also surprisingly easy to make and distribute to potential customers. However, you’re not limited to ebooks. You can offer any type of content your visitors crave. Make these pieces of content as valuable as possible, and your subscribers will reward you for it through social shares, comments, and eventually purchases. Free trials are offered primarily by software companies. They’re good for giving leads a taste of what it will be like being a customer. They also give you a point of contact with those people. However, free trials don’t have to be limited to software companies. If you provide a service to clients, you can offer a free consultation, which acts like a free trial. You can also send out free samples of your products to people who opt in. The object of the free trial is to give away enough of your product or service so people get a test drive, but not enough to where the paid version isn’t needed. Your goal is to help the prospect minimize the possibility of buyer’s remorse in their mind. You’re giving them proof that your product or service can deliver better than your competitor’s can. Membership areas are great for capturing and retaining traffic. However, you need to make sure people have an enticing reason to join. For example, Copyblogger gives away 16 high-value ebooks when you join their membership area. Becoming a member is a bigger commitment than simply joining an email list. So the reward must be high to capture a desirable amount of traffic. Place your most valuable content in the membership area. Make it obvious on your site that this content is back there and all people have to do to get it is join your list. You can attract long-term members…and long-term customers. You have made your website an opt-in machine. It’s optimized for people to join your email list, snag your free trial, and/or join your membership area. It’s time to work on your post-conversion funnel. It’s nurturing time! This is the set of emails that are designed to further solve a buying personas problem, build relationships and showcase that you have the right solution to their particular situation. These people are in your funnel because they’re interested in what you can do for them. It’s time to show them why you are their best choice. Remember, this is NOT an opportunity to start touting how great you are. This is an opportunity to solve or educate your lead on the problem they are having. Show them how you can solve their situation and you’ll have a far greater chance of converting them into a customer. To optimize your post conversion funnel, start with your end goal. What do you ultimately want people to do at the end of the funnel? Do you want them to seek out your consulting services? Do you want them to extend their membership to a premium version? Once you have decided on the end goal, work backwards from there. Create two bonus offers that people receive if they purchase what you’re offering. Then, create four (or more) pieces of content you can send out that will help your subscribers solve distinct problems they’re struggling with. After that, set up an email autoresponder with your email provider. Email #1 – Welcome email. Introduce yourself and say thank you for joining. Email #2 – Send out the first piece of valuable content. Email #3 – Send out the second piece of valuable content. Email #4 – Send out the third piece of valuable content. Email #5 – Send out the fourth piece of valuable content, introducing the first bonus offer at the end and hinting at the main product/service in a future email. Email #6 – Fully explain the bonus offer and the product/service, and surprise them with the second bonus offer. Email #7 – Present the full offer and give people a limited time to purchase before the bonus offers expire. The key is to base your sequence around the buyer persona you are aiming at and the particular buying cycle of your leads. If it takes them six months to make a decision, that’s how long you need to nurture them. If it takes 6 days of targeted content, tailor your email sequence around that buying cycle. That’s it! You have an automated post conversion funnel that will help generate sales and clients for you while you sleep. Keep analyzing and optimizing this series of emails to raise conversion rates and convert more leads into customers. Conversions are always the best place to start when analyzing where to spend your marketing dollars. It does not matter how much traffic you drive to your website if the user experience when they get there is awful. Take a look at the graphic below which gives a simplified overview of how raising conversion rates increases your ROI or in this case Return on Ad Spend (ROAS). As you can see from the table, Billy The Plumber has a much better Return On Ad Spend (ROAS) due to their conversion rate of 2%. So for every $1 dollar spent they generate $4 in revenue. 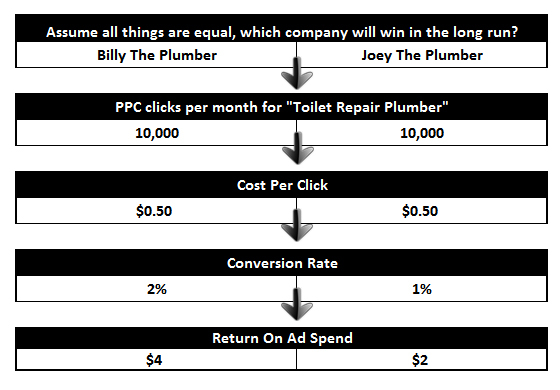 Joey The Plumber only generates $2 in revenue for every $1 spent. So by doubling the conversion rate, Billy has doubled his ROAS without raising the amount of money he needs to spend. Take this approach with all your marketing channels and you’ll have a more effective solution for determining where to spend your marketing dollars. This article was syndicated from Business 2 Community: Spend More or Convert More – Which is Better?